I was saddened to hear of the passing of the Harlem Globetrotter's Meadowlark Lemon. Back when ABC's Wide World of Sports would regularly show a Harlem Globetrotter's game (once or twice a year), Meadowlark was the star of the show, followed by dribbling master Curly Neal. I went to see the Globetrotters at least once live -- and I can't remember if Meadowlark was there, because they had more than one traveling squad. I even had a book about the Globetrotters, and one of the main subjects was Meadowlark and how he took over from the previous leader of the show, Goose Tatum. So Meadowlark's passing strikes me perhaps more than many other celebrities and sports figures of my childhood, because I remember him so well. And it's hard to forget that name. The Hill reported on how the crummy GOPs in Congress are going to try to mess with the commitments made by the USA in the Paris climate pact. Led by arch climate nemesis Senator James Inhofe, they're going to try to cut funding, tell groups how not to follow rules, and of course try to elect somebody like Ted Cruz as our next President. This is annoying. Hopefully most of it won't work. "Many hoped that the Green Climate Fund was their best chance to do just that. As negotiators were hashing out a final climate pact, Republicans vowed to block American contribution to the fund, an international pool of public and private money directed to help poorer nations prepare for the effects of climate change. But the omnibus spending deal passed this week allows Obama to find funding elsewhere in the federal budget, effectively taking the matter out of Congress’s hands." Last year, Michelle Keegan (Britain's phenomenally gorgeous actress who I've discussed on this blog numerous times) had a hot calendar, as described with a few pictures from it here. But this year, now married, Michelle Wright nee Keegan dialed it way back, and featured her fashions, rather than the figure that wears them so well. She's still gorgeous, but now she's sophisticated. Oh well. Here's the front and the back, which has small pictures of the inside monthly shots. 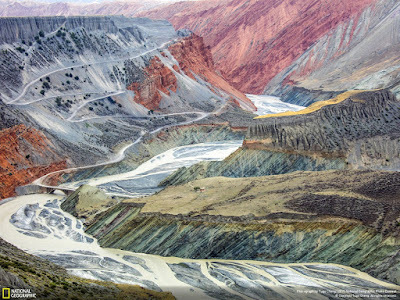 Great pictures from the winning photographs in the National Geographic photo contest (as one would expect). 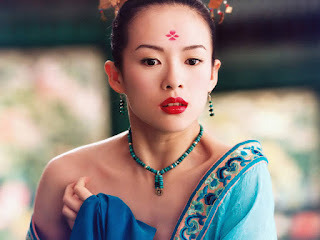 One of the most beautiful women in the world, actress Zhang Ziyi (Crouching Tiger Hidden Dragon, Hero, House of Flying Daggers, Rush Hour 2, Memories of a Geisha, and many more) just had her first child, fathered by her to-be husband, rocker Wang Feng. Her daughter definitely inherits some outstanding genetic material. 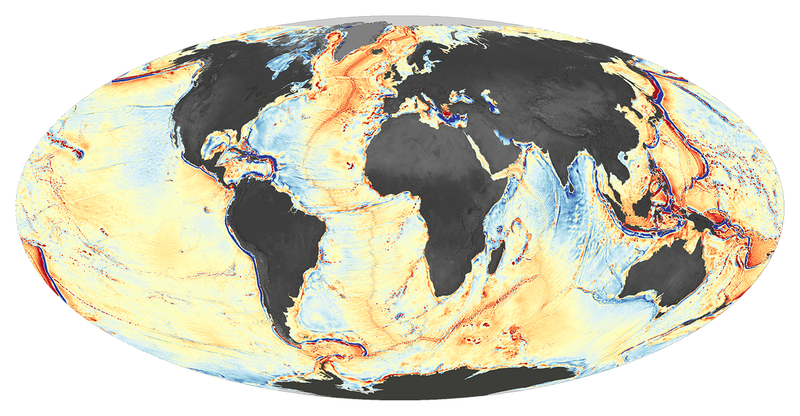 Using extremely precise measurements of the changing height of the oceans caused by the gravity field underneath it, measured by a host of satellites, researchers have produced a more accurate map of the ocean floor than ever before. 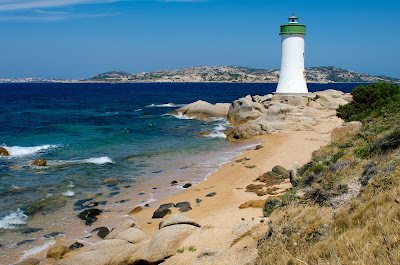 And while doing so, they discovered a lot of new landmarks (perhaps more accurately called seamarks) down there. You gotta be impressed with the technology. He was right. And it's not good news. I don't agree with the man who has the Twitter handle "SteveSGoddard" very much. (Yes, I know his real name.) However, every now and then he tweets about something interesting. "Pine beetles have declined more than 90% in Colorado over the last three years, after brainless experts blamed them on increasing CO2." I asked him for a reference, but he didn't reply. I suspected I knew why this might be happening, but wanted to confirm. So I searched and found something he posted earlier this year, on March 10. It had a link to an article. "Meanwhile, the mountain pine beetle epidemic slowed dramatically, likely because the pine beetle has run out of live trees to infest." "the mountain pine beetle epidemic slowed dramatically"
Context is everything, eh? But I want more confirmation. Let's learn some more. "They ate themselves out of house and home," said Joe Duda, deputy state forester for the Colorado State Forest Service. In other words, the beetles have gradually run out of available, stressed pine trees to eat, and their numbers are declining. While that is good news, the damage is done." My suspicion has support now. And that is a quote from the deputy state forester of the Colorado State Forest Service, who ought to know his subject. But can something more official be found? "Some efforts are being made to stanch the beetle’s spread. Forest Service officials in the Black Hills have proposed treating 248,000 acres of recently infested tree stands in hope of slowing or halting the advance of the beetles. A drought-ending change in the weather could also tamp down the infestation in some areas. But for the most part, the infestation is expected to run its course, abating when the beetles have consumed most of their preferred host—mature pine trees." So, the expectation is that when you nearly wipe out their host (the trees), the beetle population will decline. Makes sense. And Colorado has been very hard-hit. So the decline that SteveSGoddard posted about is probably real, and being real, it's not good news. But still, I yearn for an official statement of some kind. Well, here's what the Colorado State Forest Service has on their Web site, rather than an anecdotal quote from Joe Duda. I'm going to grab a lot of text and put it here, because I expect that they'll update the page sometime in 2016. (They ought to.) Note my emphasis again. "In 2014, the area affected by mountain pine beetle (Dendroctonus ponderosae) declined to its lowest level since 1996. A total area of 15,000 acres with active infestation were mapped during the annual aerial forest health survey. Most of these acres (approximately 10,000) were in Larimer County, in the vicinity of Red Feather Lakes. Infestations also continued along the eastern slope of the Sangre de Cristo Range and on Miller Mesa near Ridgway. The decline in area with active infestation is primarily due to the death of suitable host trees during previous years of the outbreak. Since 1996, almost 3.4 million acres of lodgepole, ponderosa and five-needle pines have been affected by this bark beetle. For more information about insects and diseases impacting Colorado’s forests, read the 2014 Report on the Health of Colorado’s Forests and the 2014 Insect and Disease Update." So I was right. And so was SteveSGoddard. But the reason he was right, the reason I suspected there was a decline, is not good news at all for the pine forests of Colorado (or other Western states). Because the mountain pine beetles are declining due to the fact that they've infested and killed so many pine trees. I wish that wasn't the way it is, but that's the way it is. "But I have doubted that, without major breakthroughs in energy technology, we can do much about warming. The addiction to fossil fuels will triumph." "Actual choices are harder. For example, Bryce argues that only an expansion of nuclear power could replace significant volumes of fossil fuels. But greater reliance on nuclear poses its own dangers, including the disposal of atomic waste, operational accidents and vulnerability to terrorism." "We know what’s needed: cheaper and safer nuclear power; better batteries and energy storage, boosting wind and solar by making more of their power usable; cost-effective carbon capture and storage — making coal more acceptable by burying its carbon dioxide in the ground." Very simple wrap-up: he's right. 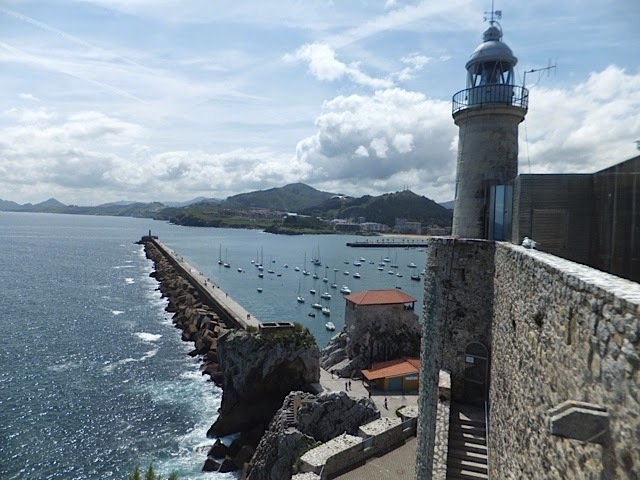 I went back to Spain for this week's lighthouse. Checking the blog, I've only featured a lighthouse in Spain once, so it's a good time for a second time. 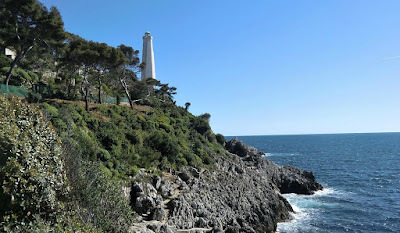 This one is quite intriguing, as the modern lighthouse is built inside the existing (older) castle of Santa Ana. 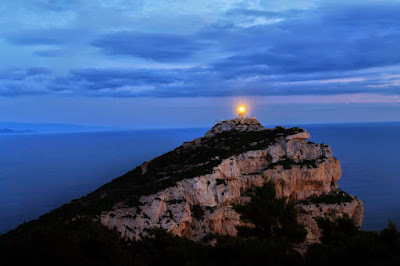 I went back to Spain for this week's lighthouse. 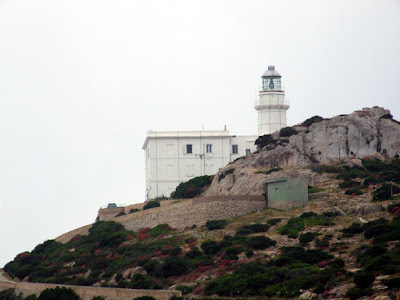 Checking the blog, I've only featured a lighthouse in Spain once, so it's a good time for a second time. 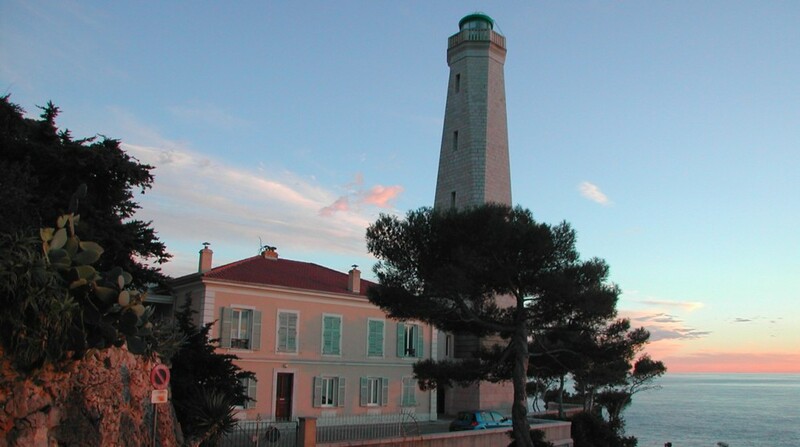 This one is quite intriguing, as the modern lighthouse is built inside the existing (older) castle of Santa Ana. "1853. 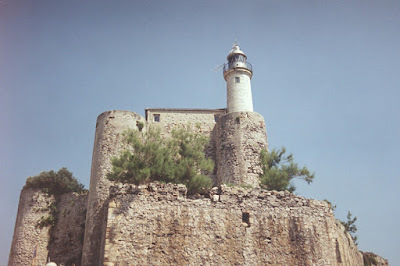 Active; focal plane 49 m (161 ft); four white flashes every 24 s. 16 m (52 ft) stone tower with lantern and gallery, attached to one corner of a massive stone castle. The upper portion of the tower is painted white; lantern dome is gray metallic." 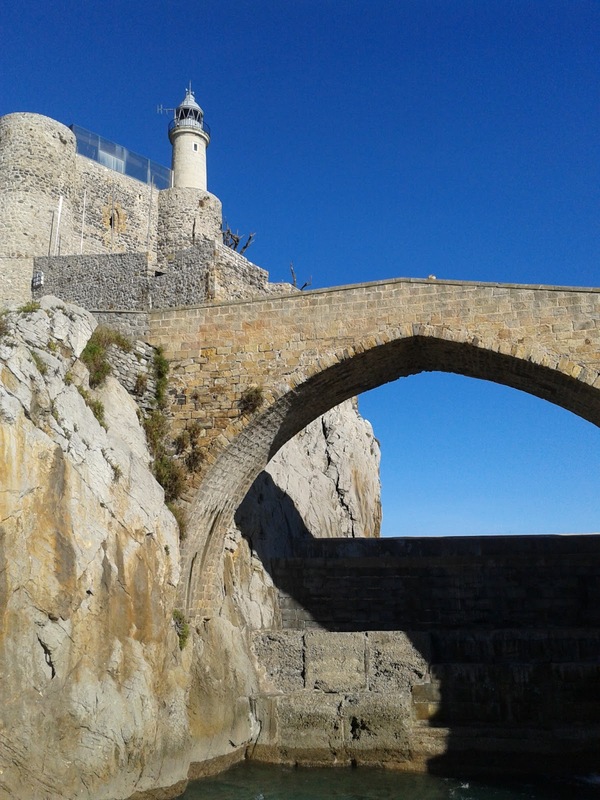 With a picture featuring the castle - and a bit more information about it. The main reason that sports succeed is because of failure. Originally my thought was about baseball, and it wasn't original, because someone else (likely several people) pointed out that even the best batters in modern baseball fail approximately 2/3 of the time. I.e., a .333 batting average, which is a hit every three times at bat (roughly), means that the other two at-bats, on average, are a failure. A strikeout, groundout, flyout, doubleplay, foul out, etc. But thinking more deeply, I contemplated the pitcher. Great pitchers allow few runs, and get lots of strikeouts, but if they did not fail a few times a game, then baseball would be terribly boring, because there would be very few runs scored. If pitchers prevented any runs from scoring or even worse, didn't allow a hit or a batter to reach first base (the requirement for a perfect game), there wouldn't be any point in playing. The offense has to be more successful than the defense, meaning that the defense has to fail, for scoring to happen. You can't have a winner if you don't have a loser. And the essence of a championship is failure - because only one team succeeded in wdinning all the necessary games. Every other team fell short. Every other team failed. Thinking defensively, the same goes for hockey or soccer. Even if goalies are successful more than 90% of the time (in the case of hockey) or maybe even higher for soccer (though there are fewer shots on goal in soccer, so actual save percentages could be lower), if they don't fail or apparently fail at least a few times, there would be very little fun, i.e. scoring. Soccer is frequently criticized because defensive failures are so rare, and tie games more common, but that makes the success -- the defeat of the defense -- even more to be celebrated. Cricket is a contrast. Cricket has lots of scoring; the odds are loaded against the defense. In cricket, the most notable failure is that of the offense, the batsman -- edging to be caught out, letting the wicket get hit by the bowled ball, or a few other modes of being called out. Basketball is similar - more commonly teams lose because they don't score enough points, rather than playing poor defense (though it's obvious teams can lose because of poor defense). While pursuing this line of thought, I thought about the Buffalo Bills football team. No other team has been to the Super Bowl more often (they went four straight times) and yet never won it. All of the other teams each year that they went would have liked to be them -- to be in the Super Bowl, but those teams failed earlier. The Bills failed at the end of the season (and notably in their first time there, a failed field goal attempt at the end was the cause of their loss). Jana Novotna failed the first time she was in a Wimbledon final. She had the chance to win it in 1993 and spectacularly met with sporting disaster. She cried when getting the runner-up trophy. She wasn't thinking about how few women ever played in a Wimbledon final, only that she lost -- to Steffi Graf, whose talent and skill and determination caused many other players to fail in Grand Slam finals! To her credit, Novotna persevered and came back and won Wimbledon (even after losing the previous year in another final), her only Grand Slam championship, and that success was enough to overcome the bitter failure she had experienced earlier. She retired soon after. And yet she even says that her failure was a very important event, if not the most important event, in her athletic career. Why think like this? Making an Olympic medal final in track and field is a huge success, but there will only be one gold medalist -- all the other athletes will fail to win. Much has been written about being fourth, just out of the medals in gold-silver-bronze sports, and now athletes that finish in that unenviable position can wonder for years what they could have done better to get that esteemed award. Being so remarkable an athlete that one was able to finish fourth in the championship final should be celebrated as such -- and yet both the athletes themselves and the fans of the sport can view such a tremendous accomplishment as a FAILURE. Is that fair? Of course it isn't. It is the nature of sport. The negative image of the thrill of victory is the agony of defeat. Winning stirs our emotions. So does losing. Losing valiantly can be as stirring as winning gallantly, sometimes even more so. So though I will wish that every athlete and team can succeed and win, I know to appreciate those on the losing side as well -- because that's what happens to a lot more athletes than winning. It's not the triumph, but the struggle -- as first voiced by Baron Pierre de Coubertin. It is the struggle that makes us appreciate the difficulty of the triumph -- Oakden Wolf. It has been awhile since I last posted a sonnet, so before the New Year, I created this tribute to someone who will likely never know their significance to me. and reverence create profound success. ... then I've got two Daily Mail articles with lots of pictures of Katie Cassidy (co-star on TV's Arrow, as the first headline says) to share with you. And she's looking real good from both sides. I just recently saw reported that NASA's magnificent Dawn probe has finished spiraling down to its mapping orbit above the surface of asteroid/minor planet Ceres. I don't know if this means it can gather any more insight into the composition of the bright spots (reportedly a magnesium sulphate salt with some included briny water ice), but now it's going to be very well-mapped. The maximum resolution is 35 meters (120 feet) at the mapping orbit altitude of 385 km (240 miles). No, I didn't get new underwear for Christmas. Turns out that scientists exploring the deep ocean have found a new and important kind of hydrothermal vent. The main thing different about the vent is that the primary structural mineral is talc, not metallic sulphides. The vent, which was found off and well below the Cayman Islands, also has a very high heat flow. Climate Change Isn't Real. It Also Can't Be Stopped. "Most conservative energy on climate change over the last quarter-century has gone into questioning the validity of climate science. Conservative intellectuals have invested enough of their reputations into this form of scientific kookery that it cannot be easily abandoned." I've noted this several times, that there has been some two-facedness in some sectors of the climate denier camp. Meaning that at the same time they say nothing's happening, they also claim that there isn't anything that can be done about what's going to happen. I find it interesting that the article employed the oxymoron "conservative intellectuals" in describing how the right-wing kind of climate denier has operated. I think that the term "intellectual" and the phrase "scientific kookery" have no real business being used in the same sentence together. Rather than "intellectual", in this case a better word might be "groupthinkers", because groupthink implies collaborative self-deception toward formulations of, or support for, erroneous conclusions. Something that it has been definitively psychologically shown the Republicans and conservatives do very frequently. 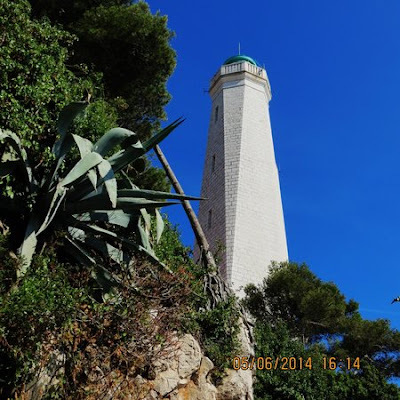 Decided to go with a famous lighthouse this week, the Cap Ferrat. "1952 (station established 1838). Active; focal plane 69 m (226 ft); white flash every 3 s. 32 m (105 ft) octagonal stone tower with lantern and gallery, attached to a 2-story masonry keeper's house. The tower is unpainted white stone; the lantern is green with a white roof." I knew it was famous, but I didn't know this happened: the original lighthouse was blown up by German troops in 1944. 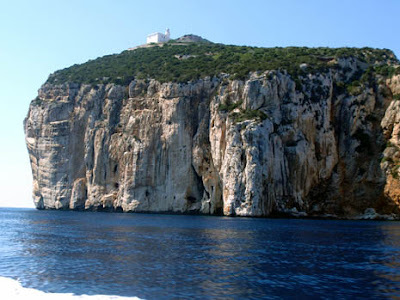 "Cap Ferrat is a very prominent cape projecting into the Mediterranean between Nice and Monaco." Location, location, location. When Monaco, Nice, and Cannes are your neighbors on the coast, you're likely to get famous. Here's two maps. More incentive to watch Grease Live! How much more incentive do we really need, at this point? Still, Victoria's Secret (as well as the Sports Illustrated swimsuit issue) tend to have models with curves, more so than beanpole runway models. But this particular model, Vita Sidorkina, is pushing the limit between "slender and curvy" and "downright skinny". She also looks 16, but a lot of supermodels look 10 years younger than they really are. Here's how she looked in the holiday show. Quite tight. Still, she has curves if you know where to look for them. I found some. She's posed a lot in their Pink line, which is geared for the 17-20 year old set, and she still looks quite teenagerish. (She's 21). So that works. But much as I hate to say it, based on the way she looked on the beach, she could use a hamburger and a pizza. The New York Times has a neat animated feature about the larger moons of Saturn. Newspapers have come a long way. While I've seen images of all these moons before, this is a new perspective. The big "Death Star" crater on Mimas, Herschel, doesn't look as prominent here as in photographs with more shadow. And there's just not a lot to see on Titan. Iapetus, of course, is truly weird. A group of American investors has decided that Crystal Palace, the soccer team in the Barclays Premier League, is worth investing in. I'm not totally sure how they arrived at that conclusion, but since they did, they're investing a cool 100 million pounds in the club. Though according to Coach Pardew, the team won't spend much on transfers when the transfer window opens in January, this money should substantially upgrade the club in many ways. So they might in a few years contend with the big money teams for a top 4 spot in the BPL. Meaning a ticket into the Champions League. A team and its fans can dream. "The development comes after a protracted negotiating process with the new investors that has taken almost a year and a half. It means plans to improve and extend Palace's Selhurst Park ground will soon be put in place, with the new money enabling work to begin quickly." I have expounded on her attributes before. Just search the blog to see. Now, as far as I know, she has never posed totally starkers ever, but most readers of the Sports Illustrated Annual Swimsuit Spectacular will fondly remember that she did pose with nothing but cleverly arranged paint upon her fair integument. The reason I bring up the stunning Ms. Clancy again is that she just did a day for the LOVE magazine Advent calendar. This is an annual feature where lovely lasses star in short, saucy (as the Brits say) videos to celebrate each day of the Advent season (you know, the anticipatory days before Christmas. Well, on her day in the LOVE Advent Calendar, Ms. Clancy took it to the next level. Many of the models just shake their thangs in skimpies, but Ms. Clancy strips off (also something the Brits say) divinely. If Peter Crouch is watching this, I hope he realizes what he has in this treasure. There was an apparent instance of marital infidelity a few years ago, but apparently Abbey put that in the "boys will be boys" column, got over it and past it, and had another child with her towering soccer-playing spouse. And for Pete's sake, I hope it stays that way. By the way, her Twitter handle is @OfficialClancy. Interesting article about Ted Cruz from conservative voice Ruth Marcus. You can read the whole thing if you want; I pulled out her specific statements about how much respect Senator Ted Cruz gets from his colleagues in Congress. And also one stark comparison to Donald Trump. Which is to say, he gets no respect at all. And Marcus goes out of her way more than once to note that. - "Just ask the Senate colleagues who join in remarkable, scarcely contained bipartisan loathing of the man." - "The fact that senators of both parties despise him has tended to obscure the substantive threat he poses to the country." When I decided to look for a couple of lighthouses on Sardinia, I had no clue that I would find one as strikingly situated as Capo Caccia. Capo Caccia is on the northwest coast of Sardinia, on a long spit of land west of the city of Alghero. Obviously, when you look at the pictures below, it sits on a high bluff. 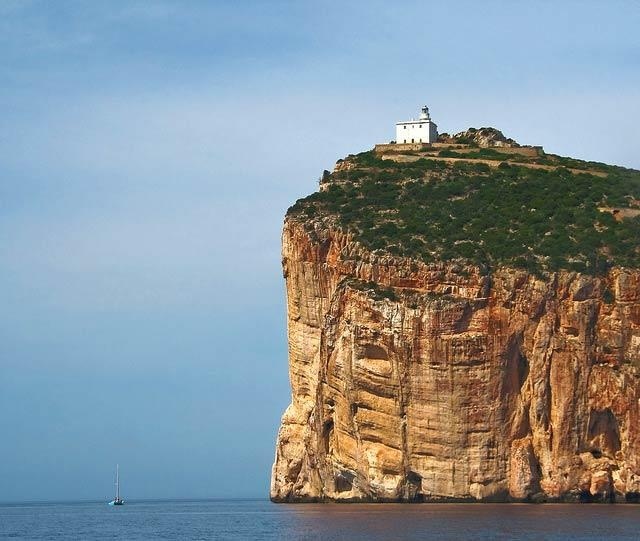 It's as striking as Split Rock Light on Lake Superior or Heceta Head in Oregon. Because it is so picturesquely located, most of the highest quality pictures of it are commercial, with watermarks. Below are four pretty good pictures from non-commercial sources. If you want the really good stuff, just search for it. Well, I thought the marriage of Cheryl Fernandez-Versini (formerly Cole) was a bit precipitous when it happened. Unfortunately, if this Daily Mail article is to be believed, their might be problems in their short union. As my many posts about her attest, I like Cheryl a WHOLE lot. She's gone through a bit (including malaria and an aborted attempt to establish herself in the U.S. market), so I want her to be happy. I certainly don't want her to have more drama and trauma in her personal life. So I hope this just turns out to the type of brief rough patch every marriage hits, and that they can work it out. And I also certainly hope that he realizes what he's got. OK, I want every guy who thinks along the same lines as the Subject line above after seeing this picture and then reading the article to raise their hands. Most of you? I thought so. But I think many of us might get hurt if we attempted to duplicate Zlata's flexibility in feats of manly prowess. Though it's near the end of its spectacular mission, the NASA Cassini probe is not done sending back spectacular images of Saturn. 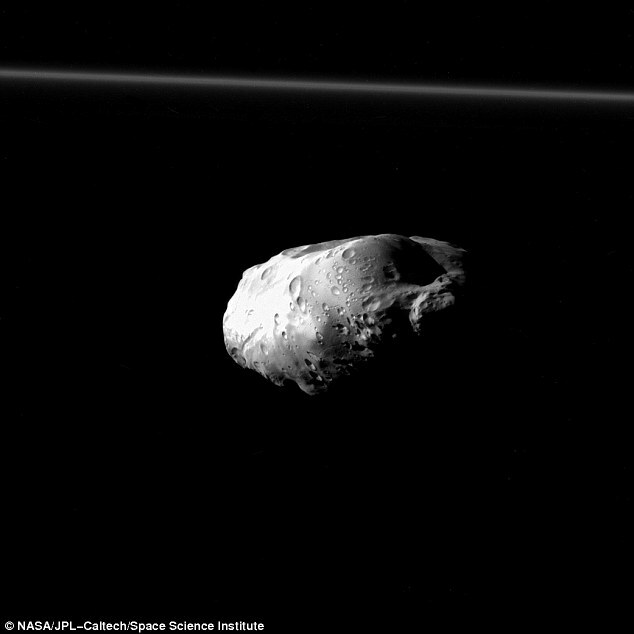 Here's a close-up of Prometheus, a small moon that will always be just a speck in Earth-based telescopes. As this article describes, it also got a great view of Epimetheus, another in Saturn's family. I looked at this Web feature to find out how well-traveled in the culinary world I am, and the answer is: not very. THREE. Beignets at the Cafe du Monde, lobster roll in Bar Harbor, and poutine in Montreal. And I've also been to Katz's Deli, but I didn't have the pastrami. I probably should have. And I've had pizza in Italy (but not in Naples). Now, I don't think I'll have any shot at all 49. But I would like to get up to 6. So my goals are fish and chips in London, fish tacos in Mexico, and a sachertorte in Vienna. 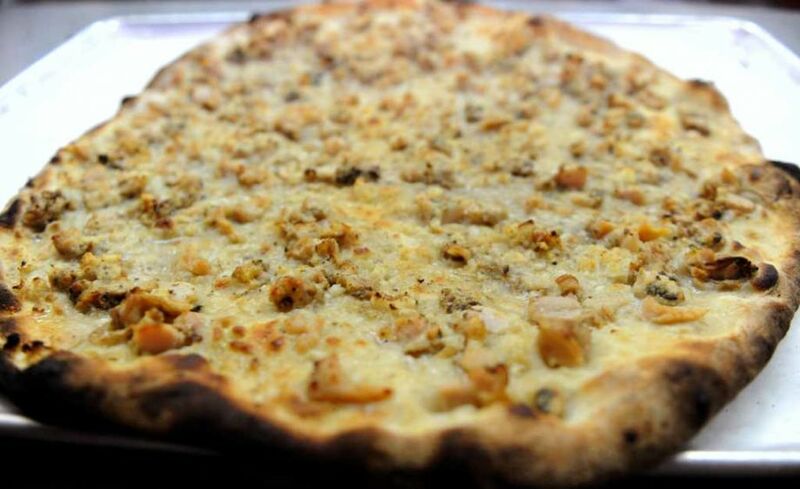 And I might be able to get a white clam pizza in New Haven, too (pictured below). Well, it's about time. After months of observing as the Dawn satellites spiraled in toward a closer orbit of asteroid aka dwarf planet Ceres, scientists think they know what the bright white spots are made of. They think they are a salt, a form of magnesium sulfate called hexahydrite. Darn - back so far as April I thought they'd turn out to be ice. But apparently the data collected so far indicates that they are a salt, made of substances brought from a subsurface briny layer to the surface by an impact. But ice is still part of the story, even if the brightly reflecting spots aren't made of it, primarily. What the astronomer asteroid geologists think happened is that the impact brought a brine to the surface, whereupon it froze, whereupon the water sublimated to space, whereupon leaving the magnesium sulfate bright salts behind. One other aspect of this is that the crater haze seen near the spots is putatively ascribed to remnant bits of ice still in the ice sublimating quietly, and taking a little salt and dust with them as they do so. So if this turns out to be what they say, then even though the spots are not mainly ice, there's ice involved in what Dawn is seeing now, and ice was involved in what made them. (Not like this is a surprise, as most of the big moons of Jupiter excepting Io are mixtures of rock and ice.) But the interesting part is that there's enough subsurface water, apparently, to help make the spots shine bright. What about the military? We need more bombs, and planes, and missiles to fight terrorists and ISIS. What about mental health? We want less mentally ill people having guns (as Speaker Ryan himself said). I think seeing spending going down, and taxes going down, and having to pay for all of this important activity as being two conflicting interests. I'd prefer the country had enough money to pay for the war on ISIS and to treat mental illness. 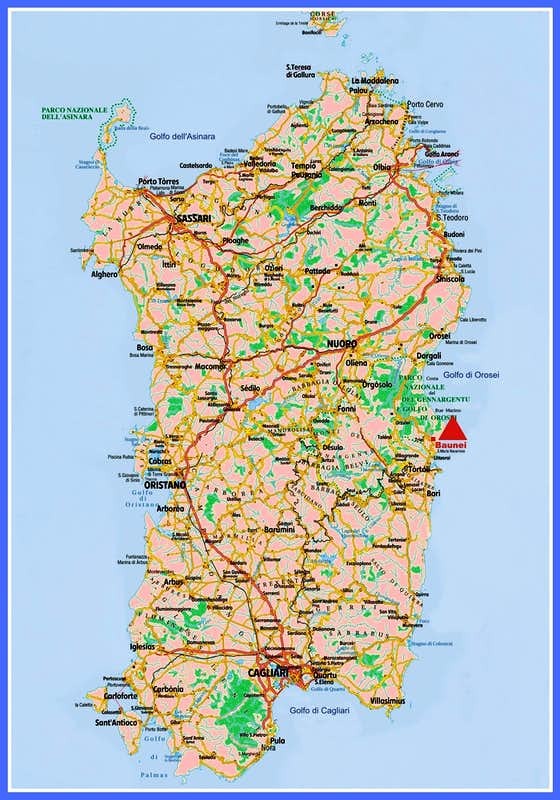 Sardinia is a large island in the Mediterranean, and as such has a lot of coastline and many lighthouses. I'll do a couple over the next two weeks. 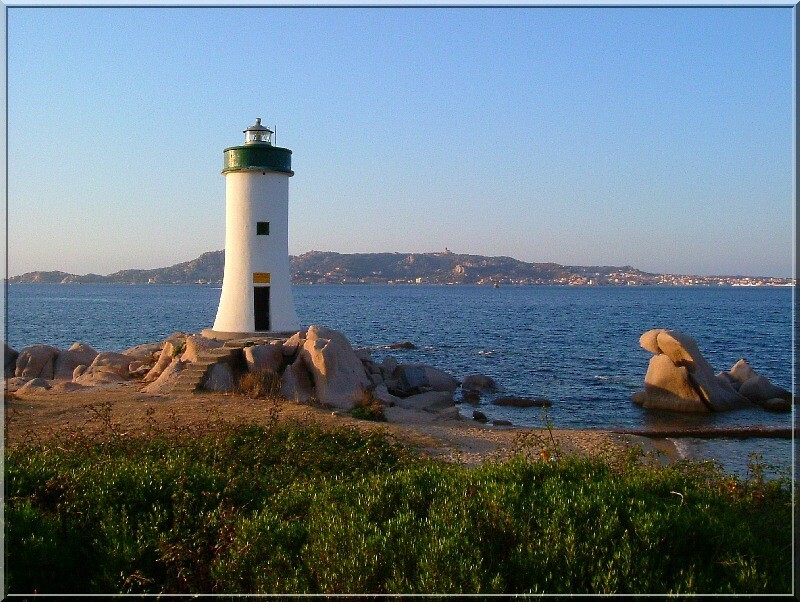 "Palau is the ferry terminal for ferries serving the Arcipelago di la Maddalena and the national park encompassing those islands. The lighthouse is located on rocks just off a promontory northwest of the harbor of Palau." 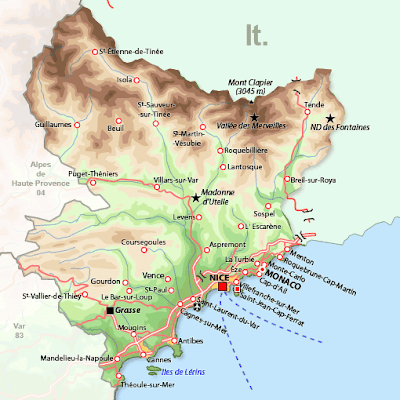 Checking a map (like this one) indicates that this area is nearly at the northern end of the northeast coast of Sardinia. A couple of years ago (March 12, 2014 to be exact) I noted the physical virtues of Canadian ice dancer Tessa Virtue in the posting entitled "Figure Skaters are FIT". As my esoteric mind does sometimes, I suddenly found myself wondering what pretty Tessa was up to these days. Turns out she's still performing - not a surprise. And she's still very pretty - not a surprise either. But I was surprised (slightly) to find her Instagram, and also slightly surprised to find out she was just releasing a new jewelry line, with jewelers Hillberg and Berk. Or it's an exclusive limited edition inspired by her. Or something like that. No matter what it is, she looks great (and remember, she's also FIT). This is the lead-off picture on her part of the Hilberg and Berk site, but she's so pretty in it that I had to show it again. And here's another bejeweled shot, this time in pearls (not sure who they're from), but she looks great here too -- not just fit, but hot. A couple of months ago, when musing about the multiple gun murder in Oregon, I suggested that there should be a "no gun" list. In fact, that was the title of the post. "If someone is on record as a) making threats, b) attempting or indicating a desire for suicide, c) expressing a desire to harm or injure another person, d) being a professed member of a group or groups that advocate violence toward a different group, e) having a psychological condition or having a family member with a known psychological condition, and f) writing a rambling manifesto expressing threats, endangerment, or hate for other people or groups -- their name should go on a basic "no gun" list. It means they can't buy guns and they can't have guns. If they have guns, they get taken away until they can show that they or the individual associated with them (with the psychological condition) pose no danger to the community." "Ryan said U.S. mental health laws are outdated and that people with mental illness should not be able to buy guns. Congress, Ryan said, is currently looking at whether there are gaps in enforcing laws that need to be filled. "We have to think these things through before we just have knee-jerk reactions," the speaker added, and noted that it was important for Congress not to infringe on the rights of citizens. Ryan is a major proponent of the Murphy bill, which he said would address "people with mental illness that are getting guns and are conducting these mass shootings." Rep. Tim Murphy (R-Penn.) introduced the bill after conducting extensive research in the wake of the 2012 shooting at Sandy Hook Elementary School." So, yeah, there's some similarity of thought. I wonder how much funding the Republicans have cut over the past decade that would have funded better and more extensive mental health treatment programs, hmmm?? Wish I could ask the Speaker that one. Well, when I wrote the post "Just in time for (you guessed it) Christmas", I didn't know what the future held for the effect of El Niño on the temperature of the lower troposphere. 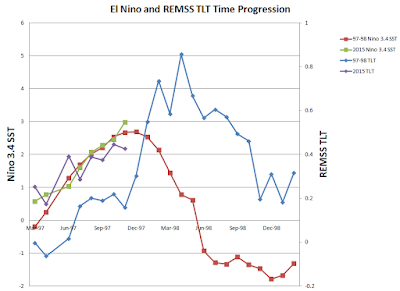 All I could do was compare the progression of this year's event to the progression of the previous mega-El Niño of 1997-1998. What I didn't realize when I first did this back in October was that the progress of the event would be so parallel to what happened in 1997-1998, even down to its month-to-month evolution. But that's what appears to be happening. So I've plotted up the November TLT temperature from Remote Sensing Systems, and I averaged the weekly Niño 3.4 temperatures from the NOAA CPC (because I couldn't find a monthly value yet). I checked my averaging for the previous month, and it was very similar to the monthly value I'm using for October, but I'll check back on that. What is astonishing (and worth checking) is the extremely high sea surface temperature in the Niño 3.4 region. If you look back at 1997-1998, it's never been this high before. EVER. Before this month, the highest anomaly was the last week of November 1997, at 2.8. Two weeks ago, it went up to 3.1. All that heat has to go somewhere. The tropical tropospheric temperature, according to Rockin' Roy Spencer, is the same as it was last month (which is to say, very warm). So if the atmosphere behaves like the atmosphere is supposed to behave, over the next month the warmth should start to spread globally. Particularly if this ongoing event wants to maintain parallelism with 1997-1998. Here's the plot. So is the global TLT going to start its upward ascent just in time for Christmas? Soon into the New Year, we'll find out. I didn't think that following quickly on the heels of the news that Russian athletes were under suspicion for doping at recent Olympics, that the Russian Federation would accept a competition ban (for track and field). It's good for the sport, though sadly the problem of doping will likely never go away. But it's tough on the Russian athletes who didn't do it, and especially those who weren't planning on doing it, but who now can't compete in the next Olympics. But this is just for track and field. Based on what has been recently written about the water offshore of Rio, the athletes who have to compete out there might wish they were banned. Want to swim in this Olympic water? In this age of rampant professionalism (including salaries and bonuses) in sports, the Davis Cup of tennis stands out as an anachronism of amateurism. The players don't play for money, they play for country. Without appearance fees or anything else, just for their country. And they also play real tennis, no tiebreakers, in any set. For many years and for many countries, the Davis Cup was their main sporting event. It seems almost quaint now, but it used to be one of the premier sporting events on the calendar. So winning it still means something, and this year, led by the heroics of Andy Murray, the Brits have captured the Davis Cup by defeating the team from Belgium. Andy may not have won everything he could have or should have (though his timing is good, first winning the Olympics on the Wimbledon centre court and then following that up by winning Wimbledon), but he came through this time. He won both of his singles matches (both in three sets). He and his brother Jamie won the doubles match in four sets. So this is very much Andy's Cup. Once upon a time, I wrote a post about Arrow actress Emily Bett Rickards, known on the show as Felicity Smoak. Surprisingly, it's been a very successful post, with hundreds of hits (good for my little blog). Now, Emily isn't such a big name that she's often in the public eye, so when the Daily Mail teams up with the paparazzi to bring us Emily on the beach in a bikini, we must acknowledge their effort. She's got a wonderful womanly figure, not the freak-of-nature kind that models bikinis, but the fit and curvy kind that looks quite good. Oh, and in case you missed last year when she and Oliver finally got busy, here's the top-drop GIF (from the back, because this is not HBO). From the Washington Post, a commentary from Eugene Robinson about climate and the climate conference in Paris, and the movement toward clean energy happening globally (though the U.S. is dragging its feet, of course). A: "Two important things have happened in China. First, the nation’s leaders have come to realize that the noxious, choking, particulate-laden smog that periodically blankets major cities — as is happening this week in Beijing — poses a real threat to the Communist Party’s legitimacy." B. "The other big development in China is that its leadership — rather than deny climate science, as most Republicans do — is making a huge bet on clean energy." China is leading the way, well ahead of us, on societal energy transformation. They have to. The question is, will the U.S. keep up, follow, or fall behind? I was checking back in my archives and discovered that although I have posted Lighthouses of the Week from several Scandinavian countries, I had not posted one from the Netherlands. So I went happily searching for a lighthouse from the Netherlands, and I found one that doubles as a monument. 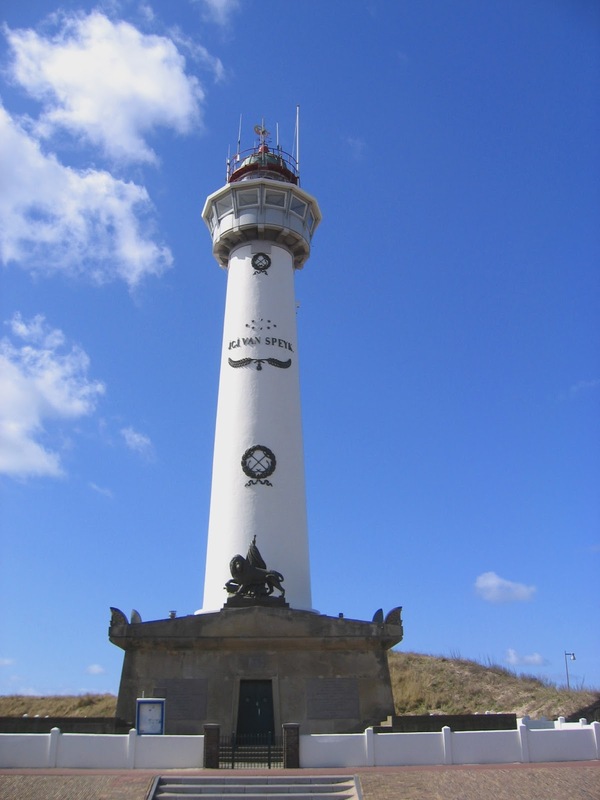 So this week's Lighthouse of the Week is the J.C.J. 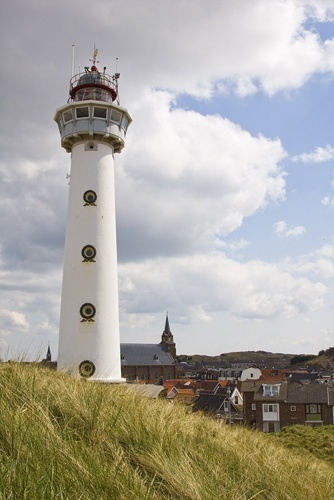 van Speijk lighthouse, which is on the North Sea, as are probably most of the lighthouses in the Netherlands. 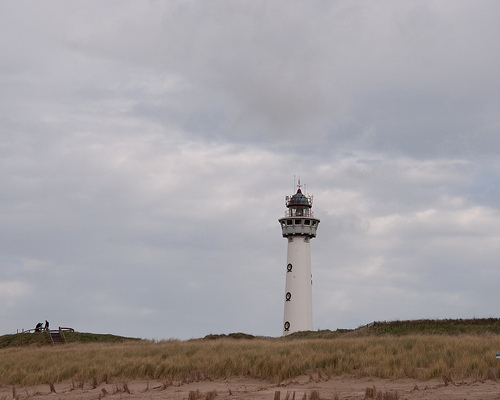 It's located in Egmond aan See, which I'm guessing translates as roughly "Egmond on the Sea". Here's a video with five facts about it (that's different).